Another Iowa Hawkeye linemen is selected in the first round of the NFL Draft. Tackle Brandon Scherff, a native of Denison, didn’t have to wait long to hear the NFL commissioner call his name Thursday as he was selected as the 5th pick in the first round by the Washington Redskins. Scherff decided to come back for his senior season and was a consensus All-American and Outland Trophy winner as the nation’s best college lineman. 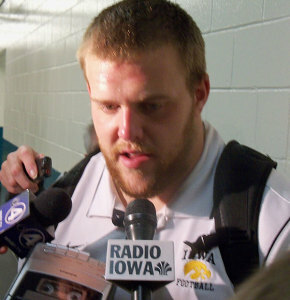 Scherff joins Riley Reiff in 2012, Bryan Bulaga in 2010 and Robert Gallery in 2004, as Iowa offensive linemen to be picked in the first round of the draft.